A fine Scottish Victorian interior scene by Gerorge Hay RSA. It depicts Mary Queen of Scots in Holyrood. Housed in a fine gilt frame and with Aitken Dott and Sotheby provenance, it is in excellent condition. 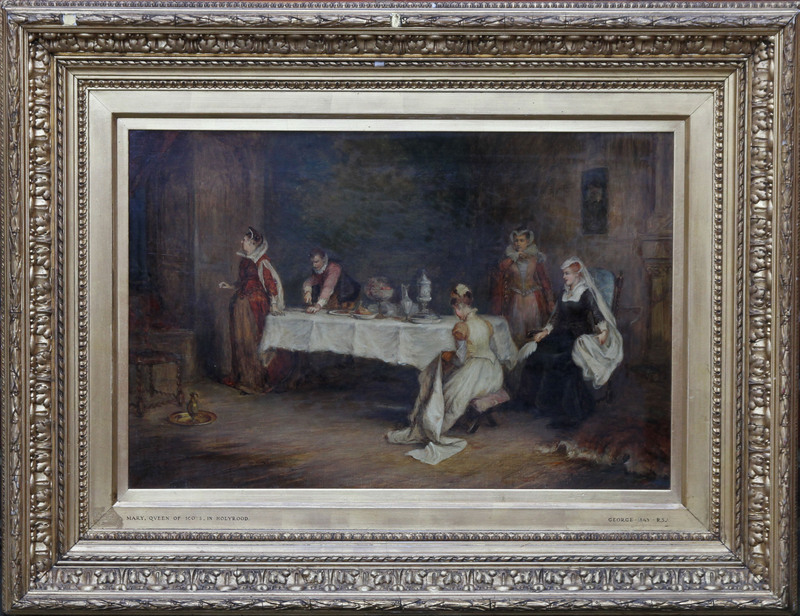 A very vibrant stunning Scottish historical interior painting which dates to about 1870. Provenance. Sotheby. Aitken Dott - The Scottish Gallery. Framed in a stunning gilt gallery frame 32 inches by 26 inches. Very good condition. George Hay (1813-1912) was born in Leith, Edinburgh. He studied under Roert Scott Lauder (1803-1869) together with William Quiller Orchardson(1832-1910), William McTaggart (1835-1910) and Hugh Cameron (1835-1918). 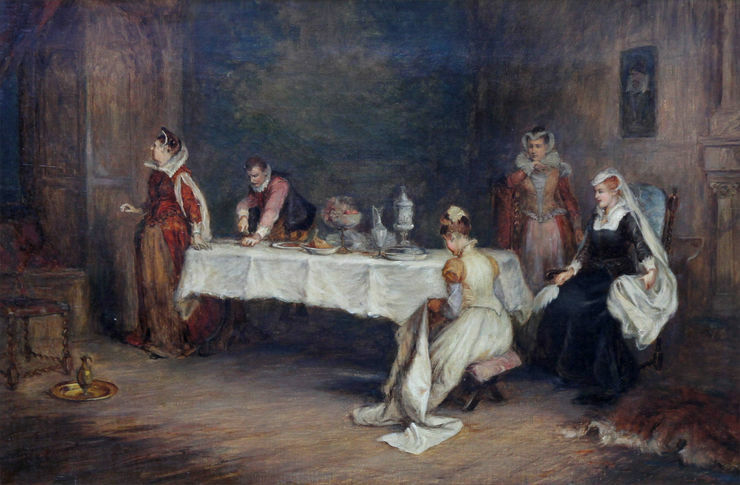 Hay specialised in narrative paintings, his subjects often inspired by Sir Walter Scott's Waverley Novels. He became an Associate Member of the Royal Scottish Academy (RSA) in 1869 and a full member in 1876, appointed Secretary of the Academy in 1881 and 1907. In 1878 he was a founder member of the Royal Scottish Society of Painters in Watercolours (RSW). He is recorded as living at several addresses in Edinburgh, including 3 Kings Place, from where he exhibited from 1856 to 1864, 16 Picardy Place (1865-1787), 12 Queen Street (1876-1882), 63 Queen Street (1883), 9 Castle Terrace (1884) and 7 Ravelston Terrace (1885-1926). he exhibited 132 works at The Royal Scottish Academy between 1856 and 1913 (and two further works were exhibited posthumously in 1926). His work "Caleb Balderstone's Ruse" is part of the Diploma Collection at the Royal Scottish Academy.